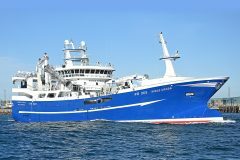 In the week that the extensively refurbished seiner/trawler Opportune LK 209 was handed over to Shetland skipper Ross Christie, Macduff Shipyards also had four new builds at varying stages of completion, reports David Linkie. trawler Venture III at Macduff. 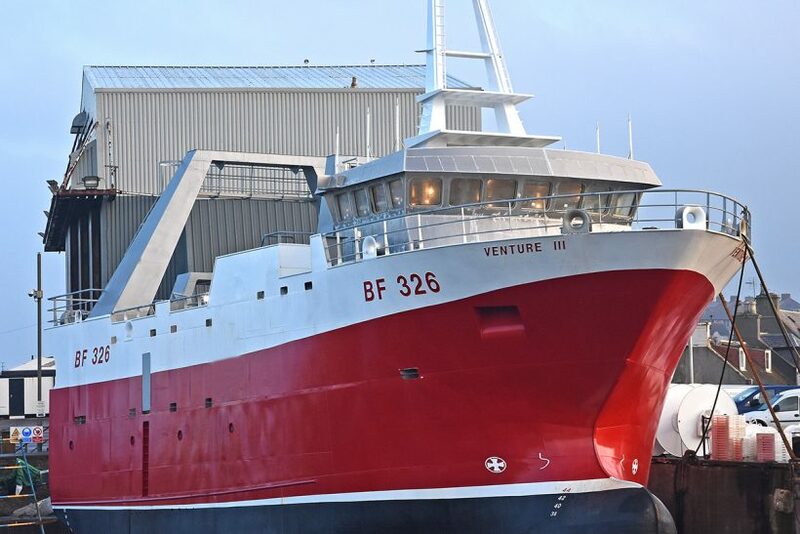 The most advanced of Macduff’s new quartet, the 24m twin-rig trawler Steadfast Hope BF 340, built for skipper Zander Nicol of Nichol Fishing LLP, is expected to be rolled out from the fabrication hall onto the adjoining slipway early this month. Steadfast Hope features a Caterpillar C32 main engine, Masson 9:1 gearbox and a 2500mm-diameter propeller. Three Cummins auxiliary engines, one hydraulic and two electrical, have also been installed in the engineroom. 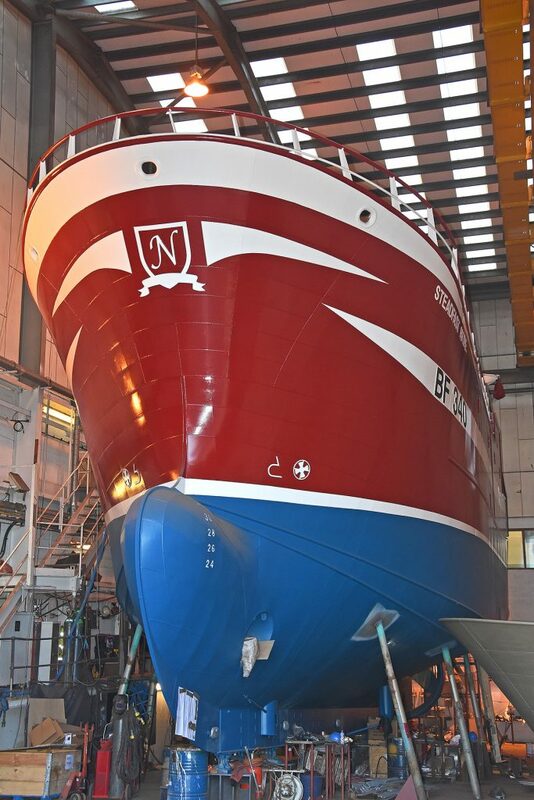 The fully painted Steadfast Hope ready to be rolled out from Macduff Shipyards’ main fabrication hall. In recent weeks, a number of hull modules of a similar design have been being fabricated in the building hall, for Gardenstown skipper Zander Jack, ready to be placed into position as soon as the keel is laid immediately after Steadfast Hope is launched. Machinery installation and internal fitting-out work is also in progress on the new 29.9m twin-rig stern trawler Venture III BF 326, which is berthed alongside the quay just 20m from Macduff’s main building hall and machining shops. Venture III’s MaK 8M20C main engine, Mekanord 580HS 6.06:1 reduction gearbox and two Caterpillar C9 auxiliary engines, together with the vessel’s extensive package of deck machinery supplied by Rapp Marine, are now in place on the trawler. 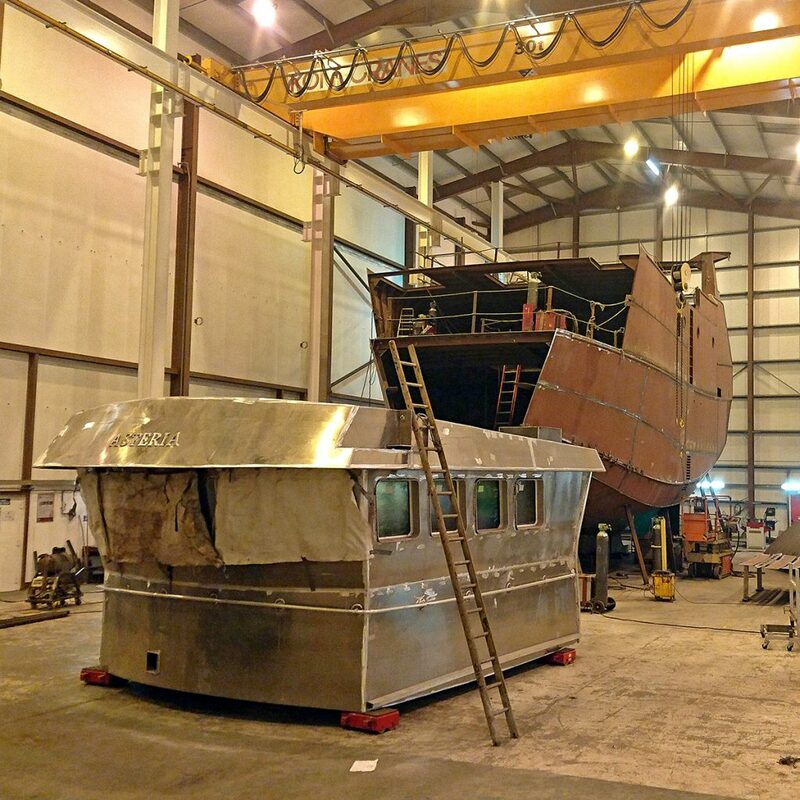 Construction of a new design of 19m twin-rig trawler, for Isle of Skye skipper Andrew Montgomery, in partnership with his dad Alasdair and the Asteria Fishing Company, is progressing well in Macduff Shipyards boatbuilding hall at Buckie. Of LOA 19m, 16.45m registered length, beam 7.2m and a moulded depth of 4.1m, the new vessel will replace the 16-year-old 18.2m twin-rig trawler Asteria BRD 250. Work in progress on the new Asteria in Macduff Shipyards’ fabrication hall at Buckie. Andrew and Alasdair Montgomery’s new boat will be powered by a Caterpillar C18 main engine coupled to a Reintjes 7.409:1 reduction gearbox. A Mitsubishi 6D24TC auxiliary engine will drive the trawler’s main hydraulic engine, while a smaller Mitsubishi S4KT electrical generator will also be fitted. 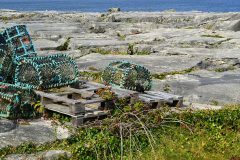 Read more from Fishing News here.